7am - We have been searching for a solution to Little Honda's hitch and leveling problems for a very long time. Just last Thursday we spent several hours driving all over the Portland area visiting spring and suspension shops. At the end of that day, the conclusion was clear. There was no solution for a 2013 Honda FIT. This morning we visited online the Firestone Ride-Rite website. You may view that website yourself by clicking [Here]. We found EXACTLY what we were looking for! A suspension system for a 2013 Honda FIT. Our Little Honda! What all of those spring and suspension shops informed us was not available, is actually available! What is the lesson for us to learn here? : Never give up! system is installed, we want the hitch replaced. 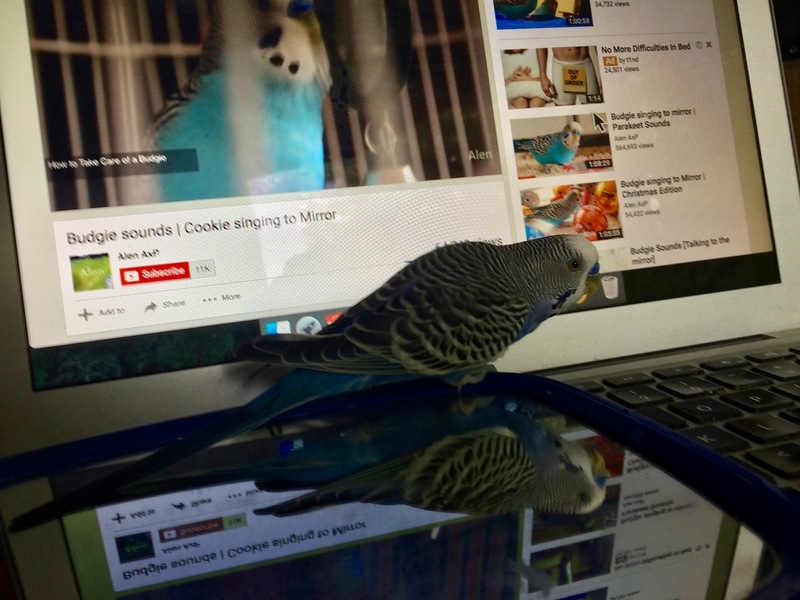 Baby Boid loves to hear other Budgies singing on YouTube videos. Boid is pretty tame. 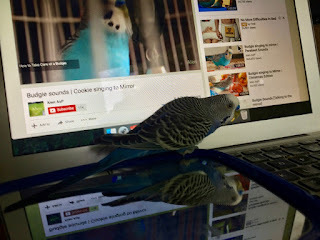 In the morning when he receives fresh seeds and fresh water, he lets me pet him and hold him in my hand! You bring up a good point about "So-called experts!" Wonder if one of those would fit in the seat of my pants ? I tried suspension shops years ago and nobody wants to do air bags, but found you can get them on line and some rv parts stores. You are referring to your times in the Olden Days? Things may be quite a bit different in the Now A Days! Ever seen the La Kunn "C" RV, just interesting? They say it sleeps four but they are Japanese. Oh yea, steering wheel is on "wrong" side too! You like? Maybe buy one. Come around and show it off to me. And as a bonus, Oregon has no sales tax! George, I had Ride Rites installed on my Chevy pickup in 1978! I needed to level the truck for a heavy Lance camper. Amazing that they are still in business which says a lot. Could it be that Firestone bought Ride-Rite? Goes to show. If you quit trying, you usually cannot win! We on the Scampy RV Team seem to keep trying. Even when some have lost the faith! We hang in there like grim death! I have Firestone air-ride suspension on my camper van with a control in the cab so I can adjust on the fly. I did not know they make them for small cars. This seems like a workable solution. Great tenacity on your search. Thank you sooooo much for your "Great tenacity" compliment! Glad things are turning around! How long do you plan on staying in the Portland area? I'm about an hour & a half away from you. Maybe I could stop by? Would love to meet you. Let me know if that might be possible. Mostly I stay around Beaverton. I make Camps on the street.